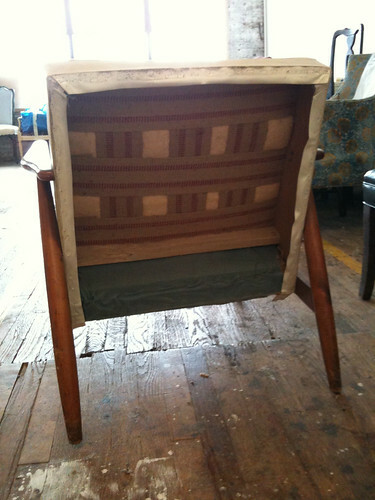 I’ve always wanted to learn how to re-upholster furniture. It all started with a sofa that we had when I was a kid that was super(!) comfy, but so ugly you wouldn’t believe. (As a side note, she tried reupholstering it years later and actually managed to make it even uglier. It was later relegated to being the “dog sofa,” and just thinking about it makes me sad.) Nevertheless, an obsession with upholstery was born! 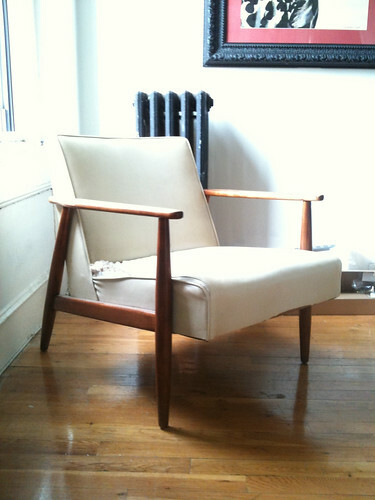 I found this mid-century beauty on the street in Philadelphia about 5 years ago tossed out with someone’s garbage. It was perfect except for a big rip in the seat, and so I towed it home with me. I knew that one day I’d redo that vinyl upholstery with something better. Like they say, one man’s trash is another man’s treasure. So starting on Saturday, I began the process of deconstruction. This is what it looked like after I got the back panel off. The back was basically a piece of cardboard covered with vinyl tacked on with upholstery tacks. 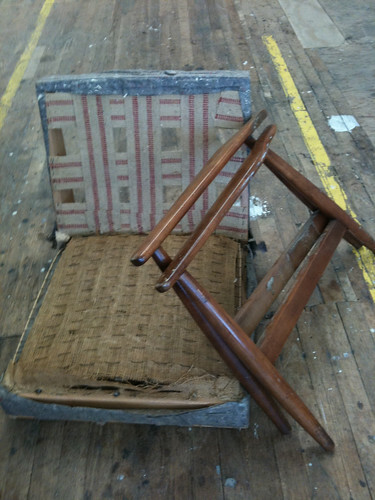 So this is the chair fully deconstructed. The legs & arms were attached via two bolts and six flat-head screws. Less than what I would have thought, but very easy to disassemble once the fabric was off and the frame was exposed. 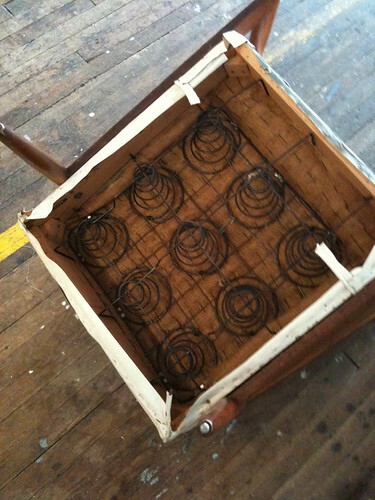 (The frame is oak I believe by the way which is also interesting…for those other furniture nerds out there.) The seat springs were covered with a horsehair “cushion” for lack of a better word (which I plan to re-use since it’s perfectly fine…but I will be augmenting it with new foam and batting). I did keep all the cotton batting too “just in case.” Also, I plan on re-finishing the arms/legs since the old polyurethane is worn off and looking ratty. p.s. if you haven’t looked into 3rd ward, i highly suggest it. They have awesome classes on almost everything.